Description: Approximately 600 pieces were produced in 52100 Carbon Steel at 62HRC. 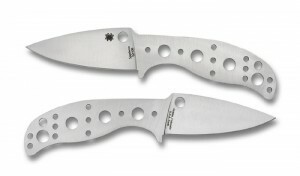 For more information on the MULE Team see the Spydie Wiki. This entry was posted on Tuesday, March 22nd, 2011 at 12:20 pm	and is filed under 3" to 4" Knives, Designer - Sal Glesser, Features - MULE Team, Handles - Stainless Steel, Manufactured - USA, Steel - 52100, Type - Fixed Blade. You can follow any responses to this entry through the RSS 2.0 feed. You can leave a response, or trackback from your own site.